SHAH ALAM: Greenhill Resources Sdn Bhd, a unit of the country's largest developer SP Setia Bhd, is bullish that its latest project, Setia City Mall, will generate big revenue. Part of the optimism is based on the high take-up rate for the mall's retail space. The estimated RM450 million Setia City Mall is due to open its doors for business in May next year. Those that have confirmed tenancy include big names like Padini Concept Store, Golden Screen Cinemas, Urbanfresh, Harvey Norman, Fitness First, Courts and Wangsa Bowl. Greenhill development director Robert Spinks said out of the 250 retailers expected 160 have confirmed their slots in Setia City Mall. The mall consists of 740,000 sq ft of lettable space spread over four levels of zoned shopping space. Its biggest tenant will be Parkson, which is taking a total of 120,000 sq ft.
Setia City Mall is jointly developed with Asian Retail Investment Fund, a fund managed by the investment arm of global property developer Lend Lease. "We are confident the opening of Setia City Mall will help boost Greenhill's revenue," Spinks said at a media briefing yesterday. He did not reveal any sales forecast. Spinks said construction work on the mall was started in 2009. "Gross development cost for the Setia City Mall is about RM450 million," he said, adding that the project would be a good and profitable venture for those involved. Rental varies from RM5,000 to RM30,000, depending on size and lots. 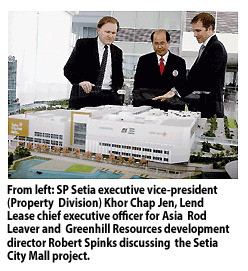 Spinks said Setia City Mall would offer much more than the typical retail destination. "It will provide a fun and affordable family experience - encompassing shopping, dining and entertainment," he said. Meanwhile, SP Setia executive vice-president Khor Chap Jen said there will be a convention centre and a 250-room hotel located opposite the northern entrance of the mall. "The construction of the convention centre, which is large enough to host a 200-table banquet, will commence next month," he said. The company also plans to launch three blocks of SoHo (small office home office) apartments next to the hotel by the end of this year.